We are delighted to announce that the 3rd international residency program for artists in Musrara has been launched. 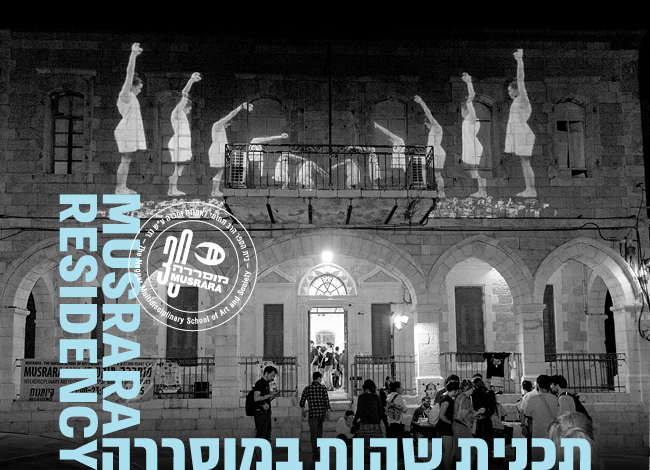 Each year, the program hosts 3-4 international and local multi-disciplinary artists who research the Musrara neighborhood and its Jerusalem surroundings and create a site-specific work that interacts with the location. The final outcome of the artists’ labor is being presented at the Musrara Mix Festival, to be held between May 29-3, 2018. - Melina Kipfumler (Brazil) and Klaus Janek (Italy), residing and working in Berlin, are a pair of sound artists. During their stay in Musrara, which began at the end of March, they are creating a sound work and musical performance that moves between the alleyways of the neighborhood titled “MUSRARAOPERA” – a local radio station that can be downloaded by festival visitors through an application. "We arrived in Jerusalem at the very beginning of the Passover holiday, when the various religions and religious views of the city caught our eyes, and we visited many religious points in the city related to Judaism, Christianity and Islam, a different and unique experience from what we are accustomed to in Berlin. We started talking to the residents of the Musrara neighborhood and heard their personal stories, while we began to work on our work for the Musrara Mix Festival- MUSRARAOPERA "
- Michal Samama (Israel) is a performing artist who creates on the seam between performance and dance. She creates performance works in various formats and variable spaces. Her works range from the theater to the gallery to the public space. She often works with items and objects so deeply embedded in the existing order that they disappear into the background and become invisible. In Musrara she will work with “Keter Plastic” chairs - mass-produced plastic objects that have become a clear symbol of “Israeliness” - Of the Israeli-familial, communal, state-run event. In this sense, the "Keter Plastic" furniture also embody a mixture between holy and mundane, between the state, almost sacred, and the everyday event - between the success, wealth, singularity of “Keter” (the crown in Hebrew), The lack of grace and the masses of the “Plastic”- To this is extent, the history of "Keter Plastic," which began as a small Jaffa family workshop and became a phenomenal success story. "I started the program by wandering the neighborhood searching for and documenting “Keter Plastic'” furniture. I found them in almost every yard, garden or balcony, organized in different ways, a random choreography of objects in space. Then I started to create the “voyage path” of the chairs in the public space of the neighborhood dnd in the School building, by thus creating short performances, unofficial, a kind of 'rehearsal for the show.' It is always interesting to see how in the public sphere every rehearsal is already an act, as well as the changing reactions of the occasional passers-by. I drag a pile of chairs around the neighborhood, people rush to offer me help. This action of the proposed aid and joint “schlepping” has become a key part of the show. " - Renata Sheppard (U.S.A/ Italy) is a transnational choreographer, artistic director and scholar who has been recognized for her innovative engagement of dance across discipline. She is a researcher who investigates interdisciplinary and innovative methods of art-making, engagement and digital technologies; her work includes a diverse range of media: dance, film, photography, social media, crowd-sourcing and participation, installation, performance, video, sound and interactive design. She is a performer, choreographer and certified Laban Movement Analyst. She uses elements of body, architecture, materials, light, projection, and sound in her choreographic "living sculptures” which often happen in unexpected, site specific locations or onthe screen. Sheppard will begin her work in Musrara in early May until the festival. In Musrara Shepherd plans to produce a series of works titled “Patina”: A hybrid movement and a visual arts project- A series of live performances that leave a tangible object. The project also provides an opportunity to integrate with the medium of photography both during and after the event. -The Residency program is made possible thanks to the support of the Cultural Council of the MIFAL HAPAIS Association.